If you have an aerobic system, chances are your septic system alarm has activated at some point. This alarm doesn’t necessarily mean there’s an emergency, just that there’s something that needs your attention. Not sure what to check? Here’s a video on what to do when your alarm activates. Although your alarm can indicate any number of problems with your system, there are a few common aerobic system problems we see all the time. No power – This is one of the easiest problems to solve. Be sure no one has turned off the power switch to your system or that the breaker is not tripped. Inoperable submersible pump – Although a new pump may be needed, sometimes the pump is temporarily inoperable due to a bad float, bad wiring, etc. Inadequate air pressure – This is often the result of needing a new aerator or a re-build kit. The aerator pump has to be operable for the system to have the required oxygen to treat the wastewater. Inoperable timer or photocell – The timer and photocell work together to hold the water in the pump tank until it allows it to be released. Inoperable spray heads – Spray heads can stop rotating, stop popping down after spraying, can be broken off, etc. What do I do when my aerobic system alarm activates? If your alarm comes on, perform the actions shown in the video linked above and then call your maintenance provider. While it is usually not an emergency, do not wait several days or weeks to call. There are many more items to the system that make it operate, so there are other items that may need attention. TCEQ requires that all aerobic systems be checked every four months. Most counties in San Antonio and the surrounding areas require a maintenance contract. 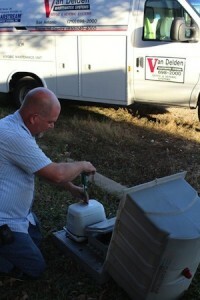 It is always best to have a TCEQ Licensed Maintenance Provider or Maintenance Technician evaluate your system. Van Delden Wastewater Systems is dedicated to providing the highest-quality systems, so we install and service only Clearstream aerobic systems. If your Clearstream system is in need of maintenance, give us a call at (210) 698.2000 (San Antonio) or (830) 249.4000 (Boerne) or contact us online now. My system is using a lot of bleach (liq) now. I find myself using a gallon a day for the system to work. What could be the problem that it needs more bleach than it did in the beginning? Some of the chlorinators are very finicky – if the valve is adjusted, its almost like they take hardly any chlorine or too much. You can have your service provider adjust your valve and see if that helps. If you adjust it then it may seem like its not taking any (compared to now). If you can mark the chlorine level then check it after a few weeks, you should see that it is taking chlorine. But, sometimes if you check it too soon, its hard to tell. The other thing is sometimes the chlorinator may leak or crack. This could also be a possibility. Digging up the chlorinator may be required to check that. Best wishes! I have a problem with the water not going from the clearstram tank to the pump tank. Never had a bleach problem. I use tablets. My system is very old. If you have a tablet chlorinator and the water is not moving from the aerobic tank to the pump tank, then your tablet chlorinator might be clogged. Sometimes the tabs get mushy and create a blockage. You can usually clear a blockage like this with a garden hose and/or the end of a broomstick. That’s something you can try yourself. If that doesn’t resolve the issue, you might need to have a maintenance provider come out. We bought our house almost 2 yrs ago. It’s our 1st time to have an aerobic system. The heads do not spray or turn anymore. More like just a running water hose. One hardly works at all. Any suggestions are appreciated! Please email me @ tbparker31@gmail.com. Thank you! Hi! I just emailed you as requested. It sounds like either your spray head(s) are broken or your spray line is broken. You will need to figure out what is going on and repair that part. There are many other items that need to be checked/serviced regularly. Most states have maintenance requirements – where are you located? In Texas, aerobic systems are required to be serviced every 4 months – some counties require a Licensed maintenance provider while some allow owners to do it themselves. If the rest of your system has not be checked, I recommend that you do that soon. Best wishes! It’s going to depend on local disposal fees and the size of your system. In our area, aerobic pumping pricing varies between $600-$800 on average. *Some aerobic systems have compartments that are buried but need to be pumped out. Be sure your pumper is familiar with your brand and that all compartments are pumped. *Some aerobic systems require that the aerator is turned off while pumping and the tank is filled back up with water before the aerator is turned on; again, be sure your pumper knows what is needed for your brand of system. It depends on the brand of spray head. In Texas, they are required to be purple, but they may operate the same way. Rotating the top usually will adjust the spray radius and/or the spray distance. Some heads require a key. However, most aerobic system regulations require a certain amount of square footage of spray area, and there are also setback requirements, so be sure you aren’t violating any regulations before you adjust your spray head(s). Our tank is filling up and not going to the spray, what could be wrong? It sounds like you pump is not coming on, but the reason for that is unknown. It could be a tripped breaker, an inoperable pump, bad float, control box issues, wiring issues, timer issues, etc. You’ll need to get a licensed technician to diagnose. My dad has an aerobic system at his house, he passed away a few years ago and I dont know who/if his system was being serviced by, my sister and I aquired the property and had no idea a maintenance company was needed. I have noticed that the “sprinklers ” have not been coming on, but there hasnt been any alarm…..what should I do? You should call a licensed company to service the system. The spray heads will only come on if water is being used in the house….sometimes you might not see them if they are set on a timer to spray in the middle of the night. Or, the system may need a new alarm, not alarm floats, new control panel, etc. All the diagnosing has to do with electrical components, so I would highly advise calling a professional to help. My a.c. person turned off my system two weeks ago. I noticed water today around the middle tank lid and checked the breaker and it was off. After turning the system back on, after an hour, the alarm and sprinklers went off but there is a smell. Question: Is my system “dead” and if so, how do I revive it? The system has not been receiving oxygen if the system has been turned off. The aerobic bacteria needs oxygen to live and treat the wastewater. If the wastewater is not being treated, the odors will occur. Now that the system is back on, the odors should dissipate but it may take a while for the system to “revive itself”. The sludge levels may have increased during this time which may lead do clogged parts or needing the system pumped sooner. If your spray heads are downhill from your pump tank, you could be getting a siphoning effect causing the seeping. Not sure why your spray heads will not come on, unless you have another issue like an inoperable pump as well. Your maintenance provider should be able to diagnose and make recommendations. Can a busted sprinkler head cause the aerator pump to stop working and the red warning light and alarm to go off.And does the aerator pump need to be replaced if that is the cause. The aerator is not related to the spray heads, although you may have issues with both coincidently at the same time. If the aerator is not working, this should cause the alarm to activate (although there are a lot of other reasons for alarm activation). If the aerator pump is not working, then yes, this should be fixed…as well as a busted spray head. The puddling may be due to a busted spray head or spray line. But, that might not be the only issue. Generally, that will not cause an alarm to activate in itself. You wont know for sure until you have the system checked. If you decide to replace the head/line yourself, and the alarm does not turn off, then you will know for sure there is also another issue. Our sprinklers stopped working and we have to manually turn the switch for them to come on and work. Today the water started overflowing so we turned the switch on and it barely sprays at all. Just a tiny stream. It has been spraying for hours. It did the same thing a couple days ago. The alarm light will always stay on until it is drained but the other day it never went off and then again today it hasn’t went off and both days just a tiny stream out of the sprinklers. I can’t afford for someone to come out so am hoping it is a fix it yourself. Just purchased home last year with aerobic system. I heard gurgling from around my tanks. I looked in the tank and the water level is up to the bottom of the lid opening and I can’t see any pipes. Also water is agitating on one side. Thats what the gurgling sound is. My pump level is good and it still goes off a couple of times a day. Is the water level too high? Maybe clog in chlorinator? The water level should never be touching the top of the tank. It could be a clogged tablet chlorinator, a clogged weir filter, or another issue. Every aerobic system brand and model are different from each other, so I don’t want to speculate too much. I would recommend contacting a professional to check it out. Most states require regular service on the system, so if you haven’t had it checked in the last year that you purchased a home, I’d recommend it.